A beautiful new window for Lechlade, designed and made by tiny hands! 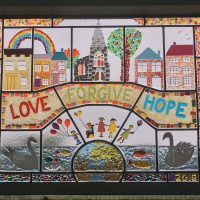 Jonathan Clark, currently a curate in Lechlade, writes on the story behind the recently unveiled fused-and-stained-glass window. Designed and created by the children of St Lawrence School (with help from Jonathan and his wife, another local glass artist, and some governors and staff), the window is going to be a real testament for generations to come. “It’s an everyday miracle, isn’t it? The way mankind has learned how to make glass, and use it to create windows to let through the light and keep out the wind and rain.” I said something to this effect in our wonderful St Lawrence Church of England Primary School back in March, looked out of the window and then promptly added “and snow”. It’s hard to imagine living in a time before glass. I said this because my wife Martha and I were in the middle of teaching the older pupils in the school how to cut and shape glass. Not an everyday activity, particularly for children. But we’ve been fortunate to take up glass art as a hobby, and have enjoyed making small and medium-sized decorations, coasters, plates and window panels in ‘stained’ or ‘fused’ glass. Along with other Governors in the school a year ago, we were wondering what more we could do to mark the Christian distinctiveness in the school. We’d already turned a rather drab little courtyard into a lovely place to sit and contemplate or pray, complete with water feature and flower troughs. Now we wondered what the children could do to symbolise some of the Christian values of the school. As the courtyard is surrounded by windows into other parts of the school, it didn’t take long to think about making a window. So it was that the lower and middle years in the school were asked to think what they’d like to see in a large window that celebrated Lechlade and the Christian faith, and what colours it should be. Artistic teacher Helen Bailey then drew up an outline design, which we then worked up into something that could be made as a combination of fused panels with lead strips between them to make a traditional ‘stained glass’ window. With the help of volunteer governors and staff, we spent many afternoons in the course of a month working with the older children to construct the individual glass panels ready to be permanently fused in a high temperature kiln. This was done by talented Lechlade glass artist, Steve Callender, who then added the lead to make it a structurally sound window, ready to last for decades, or even centuries. The final window is now in the school hall set high to catch the light between it and the courtyard. It was unveiled by the Bishop of Tewkesbury, watched by the whole school and others in the leadership of the Diocese of Gloucester Academies Trust, which the school is now a part of. Many have said that they’d like to see the window — a simple picture doesn’t do it justice —so do take the opportunity when the school has a fete or Christmas sale. Look to see if you can see the Halfpenny Bridge, houses in the Market Place, and some of our local wildlife. As well as the short form of 3 important Christian commands: to Love, Forgive and Hope. And do ask one of the children what part they played in its construction!